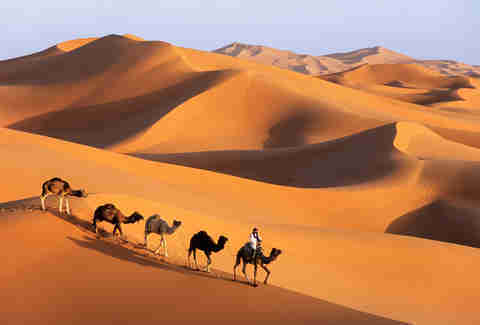 T o most American tourists, Morocco is the Tooth Fairy of travel destinations -- mythical, colorful, and otherworldly. Snow-capped mountains overlook open-air spice markets. Unforgiving deserts and red dunes meld into bustling souks and towering minarets, all of which function harmoniously within the same glorious province. Sitting at the crossroads between Europe and the Middle East, this expansive country is a spectacular, disorienting mix of old world and new age culture. It’s the sort of place you come alone to do a little soul-searching. Or with your person to test some boundaries. Or with your roommate, for that matter, to purchase some truly exceptional home goods without the Urban Outfitters markup. But the trouble with visiting such a grand, eclectic country is figuring out where to go. The colorful chaotic streets of Marrakesh, Morocco's oft-Instagrammed capital, should be only the beginning of your journey. With so much territory to cover, winging it simply won’t do. 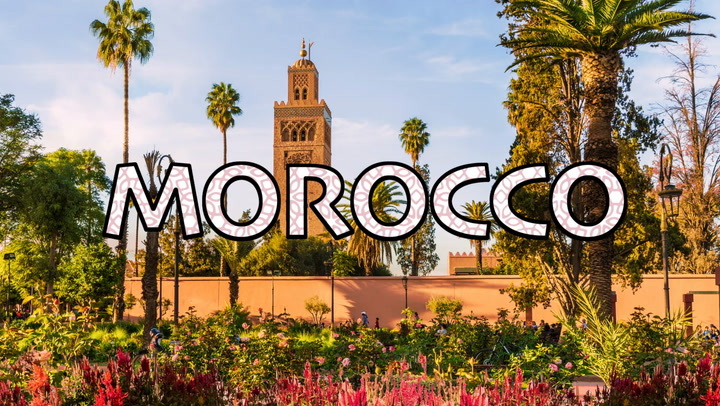 Lucky for you, we’ve got some local intel, courtesy of Intrepid Travel -- an organization that runs 27 different journeys across Morocco. With their help, we’ve masterminded a guide to absolutely everything you should know before you find yourself camel-borne, trotting into the Sahara. Read on and you'll see why we named Morocco one of the 19 best places to travel in 2019. M orocco is roughly the size of California, so don’t go thinking it’s in the realm of a three-day weekend getaway. According to Moroccan native Redouane El Mouatasim, you’ll need at least a week to explore the area in good faith. “Then you can make it to the imperial cities like Marrakech and Fez, and out to the desert,” he says. “Maybe spend a day on the coast.” El Mouatasim works with the Peak DMC team in Marrakech -- an agency under Intrepid Travel, offering guided trips around the country. When to go: Plan your trip around Ramadan. In case you don’t know, Ramadan is the holy month during which Muslim people fast from sunrise to sunset. So if you happen to be in Morocco during this time, a number of restaurants and other businesses may be closed, especially in more rural areas. But that’s not to say you should avoid visiting during Ramadan. At night, the country comes alive. With each new city or region you enter, take care to communicate with locals about what is or is not OK. No rule is all-encompassing, but it’s important that you’re prepared to shift your habits (and your outfits) accordingly. In rural areas and near the mountains, travelers should avoid public displays of affection. Save your shorts and tank tops for the big cities. For female travelers in Morocco, navigating these complex factors can sometimes prove intimidating. Outside of progressive city centers like Casablanca, Marrakech, and Fez, there are restrictions on where women are allowed to go and what they are allowed to do. It can be tricky, too, to meaningfully interact with locals or to get a sense of what life is like for Moroccan women. Some women might be more comfortable opting for a guided group excursion rather than winging it solo. For the first time ever, a travel company is offering female-only expeditions in Morocco, led exclusively by local women tour guides. Intrepid’s 8-day itinerary includes opportunities to explore rural villages and meet local women -- from female cooks, artisans, artists, and business owners. M orocco -- sitting at the crossroads of Europe, Africa, and the Middle East -- is a country whose cuisine has been created by all who’ve passed through. Morocco’s original inhabitants, the Berbers, began with grain-heavy dishes like tagines and couscous. When Arabs moved in, they brought with them nuts, dried fruits, and sweet-and-sour favors like lamb-and-prune tagines. Later, the Moors brought citrus and olives, while the Jewish Moors brought preservation techniques. Kebabs, arguably Morocco’s most well-known food, came from the Ottoman Empire, while the brief French colonial period gave the country café culture and fine wines. 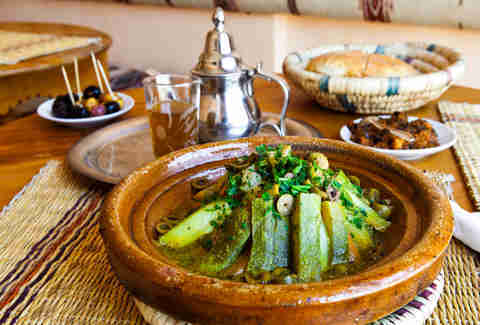 Since Morocco is a warm-weather country, the food leans towards lighter, grilled meats and vegetables, with lots of fruit and spice mixed in. Kebabs of all kinds are obviously a must-eat, as are the clay-pot tagines where chicken sits atop prunes, olives and different grains. Zaalouk – a smoked eggplant dip – is a perfect appetizer. Or if you’re feeling adventurous try b’stilla – also known as bastilla, a pie with thin, flaky layers of almonds, eggs, and pigeon meat. Finding restaurants in this country is no harder than in most places, but to get that “I’m eating in Morocco” feeling you’ve gotta hit one of the country’s bustling markets. Of course, they’re chaotic, and you can often get lost or, worse, end up eating something that makes you sick. Ayoub Fennine, assistant operations manager for Peak DMC, suggests eating at food stalls where you see Moroccan families eating, as they know best where to dine. Finally a note on drinking, both alcoholic and otherwise. Though Morocco is a Muslim country, you can find booze pretty much anywhere, and in the cities, you’ll see Moroccans drinking it. That said, many more-traditional Moroccans may be offended if you start walking around like it’s St. Patrick’s Day in Savannah, so just be respectful and consume responsibly. Also, don’t drink the tap water. Use bottled water for everything from washing down dinner to brushing your teeth. W hen you picture yourself wandering through a Moroccan medina, you’re most likely envisioning Marrakech. Snake charmers, fortune tellers, and merchants manning stalls packed with straw bags and cloth pants crowd the main plaza by day, only to be replaced by a smoky, tantalizing food bazaar at night. From all sides, chefs will beckon you towards their roasting goat’s head meat -- which you should graciously accept, along with bags of dried peaches and heaving plates of hot, sticky couscous. Eat without reserve: No meal here will cost you more than $10. Admittedly, Marrakech is tourist-heavy, but you can treat the city like your Moroccan training wheels: It’s your gateway to the rest of the country. The place is largely safe and welcoming, making it a solid destination for students or women traveling solo. You can find comfortable accommodations in a riad -- a traditional guest house -- for $40 a night or so, and there will surely be staff nearby to help you navigate the city once you’re settled. And when you’re ready to explore further, the coast, desert, and mountains lie just beyond Marrakech’s borders. Plus, the city is your best bet for flights -- so make it your first stop. Yes, the draw of walking into the same bar as Bogey and telling whoever’s there to play it again, Sam might be strong. But it’s not worth basing your entire trip around. Be warned: You will get lost. The labyrinth of colorful, narrow streets in Fez wind into one another forming an impossible maze. But however disorienting, they’re stunning -- and the deeper you lose yourself in their entanglement, the more fully you’ll immerse yourself in the culture. It’s worth spending at least two to three days here to allow for plenty of just-walking-around time. You’ll see quaint homes in a marvelous variety of colors, offset by lines of clean laundry, hanging out to dry. You’ll visit 11th-century leather tanneries where half-dressed men spend their days dying hides in the hot sun. And once you’ve sweated out just about all the toxins in your body, take a day trip to the Roman ruins and baths in Volubiles. If you’re big into Instagram, you’ve undoubtedly seen photos of Chefchaouen -- The Blue City -- and declared immediately that you must go. You, and 300 million other people. This small town of blue-washed buildings, punctuated by throngs of colorful flora and fauna, looks ready-made for Instagram. But 2018 might be the last year you can get a good shot without mobs of fellow tourists in your way. While not quite to the extent of The Blue City, the surf town of Taghazout is certainly primed for an influx of tourism. What was once a fishing village filled with a wanderlusty cohort of scruffy surfers and wayward backpackers will soon welcome a Fairmont and a sprawling new Marriott. But regardless of its changing infrastructure, Taghazout is beautiful and still relatively low-key. And this year it’s still relatively low-key. If you visit on a weekday, you’ll evade the Euro-surfer crowd. Better yet, venture into some of Morocco’s smaller beach towns. 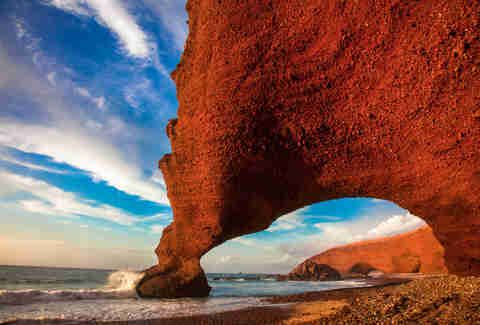 The red arch on Legzira Beach in Little Sidi Ifni is one of the most photographed spots in the country, and it’s not hard to see why. Visiting the towering structure is worth the trip alone. Further up the coast is the small town of Imsouane: “The sea there is beautiful, and the only people you’ll find there are backpackers. It’s a good day trip from Taghazout,” says El Mouatasim. Two hours north of Taghazout, the coastal city of Essaouira is about as close as you’ll get to California livin’ in Morocco -- a bohemian city of roughly 78,000 known for its art community, and its wildly fresh fish. The place is host to the annual Gnaoua Festival -- one of the largest world-music festivals on the planet, held just after Ramadan. The city itself is decked with street art, and tiny roadside grills serving the day’s fresh catch. Wherever you go, the air has a hint of barbecued seafood and salty ocean water. But magically enough, most tourists don’t seem to have caught on just yet. Get there before they do. It’s no secret that the Sahara is huge, but in spite of its size, it’s not exactly easy to access. Getting to the heart of the Sahara can easily take up to 10 hours, and our guides suggest budgeting at least three days to experience it best. 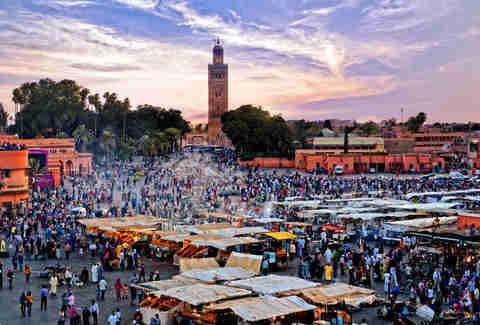 Book a tour out of Marrakech, most of which stop in a number of different small desert towns for a night or two en route. It’ll be exactly as you’ve always pictured it: You’ll ride a camel and sleep under the stars. But spend any less than three days and you’ll feel rushed. Remember, the desert is Morocco’s top attraction -- it’s worth budgeting some real time for. Come prepared for the heat… and the cold. El Mouatasim suggests bringing about five times as much water as you think you’ll need, even for low impact activities like camel rides. Which is a lot, considering the amount of H2O most Americans down in a day. Though it’s counterintuitive, he also advises covering all of your visible skin while in the desert. You’ll be hot either way, but at least if you’re covered up, you’ll be protected from the harsh rays of the Sahara sun. “If you look at the pictures of local people in this desert, they’re all completely covered,” El Mouatasim says. But don’t let the heat trick you: Temperatures can drop to near freezing once the sun goes down. You’ll certainly want to bundle up at night. While the Morocco you imagine might not be one of striking alpine landscapes, the mountain scenery is every bit as spectacular as both the desert and the coast. A 35-40 minute drive from Marrakech puts you in the Ourika Valley -- a beautiful region packed with hiking trails and crashing waterfalls. Get there before sunrise and you can take a hot air balloon tour, with panoramic views over the High Atlas range. A day here is enough, but it’s definitely worth a visit. On the lengthy drives from cities like Agadir and Marrakech to the coastal and mountain regions, you’ll find yourself dipping through valleys dotted with seemingly-abandoned cities and hilltop kasbahs. They might not make it onto tour brochures but they’re worth a stop. Many -- like the Tizourgane Kasbah in the High Atlas Mountains -- are little walled cities, where you can enjoy authentic tagine served with sweeping views. Others, like the village of Tafraoute, just a short hike off the main highway, offer museums packed with local artifacts. Matt Meltzer is a contributing writer to Thrillist who is good on couscous for a minute. Follow him on Instagram @meltrez1.